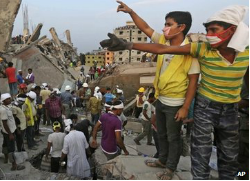 Tag Archive | "industrial disaster"
A woman was recently pulled out of the rubble of an eight-story building that collapsed in Dhaka, Bangladesh. She was alive and had survived, buried in the rubble, for seventeen days. She was one of the fortunate ones who survived this deadly industrial accident with a death toll of over one thousand people and counting. About one thousand more people were seriously injured in the collapse. Most of those individuals were women who worked in clothing factories. It is important to note that the garment industry has created jobs for millions of women, “helping them to break out of a life of dependency and grinding poverty.” While this is beneficial for many Bangladeshi women, it comes at a high price. The owners of the building and factories involved in this accident are now under investigation because of allegations that they ordered workers to continue working “despite cracks appearing in the structure the day before.” The combination of poor building materials and heavy machinery are what likely led to this collapse. Although the immediate focus is on the owners of the building and factories, blame is spreading to Western retailers and clothing brands. 77% of Bangladesh’s exports are garments, and it is Western companies that “put heavy pressure on prices, resulting in bad pay and conditions for workers.” The Bangladeshi government, industry, and workers are putting together a plan to begin improving worker safety and the European Union stated that it may consider trade action against Bangladesh if improvements are not made. Although such improvements are a step in the right direction, we must ask what role Western retailers and clothing brands should play in all of this. Kalpona Akter, a former child garment worker in Bangladesh and now the executive director of the Bangladesh Center for Worker Solidarity, opined that “more tragedies can be prevented only if the multinational corporations and retailers whose goods are produced at these factories are willing to stand up and do what is right.” Many large companies, such as Wal-mart, refuse to take responsibility for what is happening and are not taking action to ensure that these workers have better factory conditions and pay. Action on behalf of these companies is necessary to fully ensure that circumstances such as those in Bangladesh change. Although some are hopeful that this tragedy will lead to change in the Bangladeshi government, what will it take for Western corporations, retailers, consumers to demand the change that is so desperately needed? Rachel Sipkin is a 3L and the Training Editor of the Denver Journal of International Law and Policy.